The Colonial Inn is located just 20 minutes from Atlantic City and is the perfect location for a relaxing retreat and a little fun! We are located in the Historic Towne of Smithville with over 60 unique shoppes, 7 eateries, paddle boats, and more than 30 free weekend events. The Historic Village offers much to do and all within walking distance of the Colonial Inn rooms. 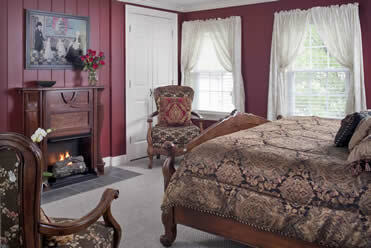 The Colonial Inn is ready to exceed your expectations with its attention to luxurious detail. Double soaking tubs or steam showers, lake side views, or a room with a porch and view are just a few of the wonderful amenities you can choose from. You will feel relaxed from the moment you arrive. For those of you who want to spice it up, the glitter and excitement of Atlantic City is just moments away. When you wake in the morning we serve up a continental breakfast of muffins and juice in a country basket, and in the afternoon we treat you with an endless cookie jar and tea or coffee.